Sweeping taxes: Last year, the entire mining sector was opened to the private sector, yet of the Rs4,044 crore worth of proposals received, it managed to attract only Rs350 crore. As demand for raw material surges, mineral-rich states have imposed sweeping rural infrastructure taxes, prompting complaints and lawsuits from miners. This comes at a time when the new mining policy, which is intended to attract $2 billion (Rs8,140 crore) of foreign investments, awaits parliamentary approval in the current session. Orissa, Jharkhand, Chhattisgarh, Madhya Pradesh and Rajasthan and Andhra Pradesh—which share a population of more than 60 million people below the poverty line in rural areas—have implemented separate Acts in the past 16 months to collect taxes from investors for building roads and other development projects. Karnataka, which does not have such a law yet, is also putting a similar policy in place, said a person familiar with the proposal. India’s mining sector was partially opened in 1993 with 50% investment initially, and 100% foreign direct investment allowed seven years later—except in diamond and precious-stones mining. Last year, the entire sector was opened to the private sector, yet of the Rs4,044 crore worth of proposals received, it managed to attract only Rs350 crore. About 80 mining companies, including Sail, Jindal Steel & Power Ltd, National Aluminium Co Ltd, Hindalco Industries Ltd and Mahanadi Coalfields Ltd, had challenged the Orissa government’s move to implement the so-called Orissa Rural and Infrastructure and Socio-economic Act last year, a law that demands miners pay up to 20% on the average value of the mineral-bearing land. Orissa had also imposed a peripheral development cess three years ago. The Eastern Zone Mining Association, which represents over 50 miners, has also filed a case against the government. The case, which was struck down by the Orissa high court in favour of the miners, is scheduled for a hearing on 17 September in the Supreme Court on a special leave petition filed by the state government. Last year, the Jharkhand government imposed a new tax calculated on the commercial value of land. This was opposed by roughly 46 companies, including Tata Steel. 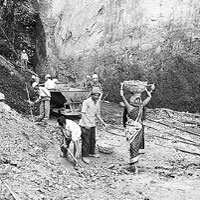 The Jharkhand high court ruled in favour of the miners and the government is in the process of filing in the Supreme Court, according to a state official. Miners in Madhya Pradesh, which implemented a new road development tax in 2005, have similarly gone to the state high court, which ruled in favour of the government. The state imposed a 5% road tax calculated on the value of the land assessed by the minerals extracted from the area. Khanij Udyog Sangh of Madhya Pradesh, an association representing 60 mining firms, has now filed in the Supreme Court for hearing, along with others. Andhra Pradesh had similarly imposed a mineral cess last year on iron ore, coal and natural gas—between Rs50 and Rs100 a tonne depending on grades and Rs60 per 1,000 cubic metre of gas. The state hopes to collect another Rs100 crore through this new cess, but cases are similarly pending, including one filed by GAIL, in the high court. Most of the states, which desperately need money to usher in development and appease local resistance, started introducing taxes after a 2004 judgment ruled in favour of the West Bengal government to impose land taxes on mineral-bearing land. But, miners who already pay royalty on minerals and two types of land rents, as well as forestry charges, already say the new taxes will make their business unviable. They say mining costs have increased and railway freight charges, despite a marginal reduction recently, have gone up 300% between 2002 and 2007. Friction between the Centre, which currently has the right to fix royalties on minerals, and states becomes evident as it considers the state collection drive as illegitimate. “The government has already said that the taxes are unconstitutional in the past," said an official in the mining ministry who didn’t want to be named. The money collected as royalty goes into the states’ consolidated funds. States have been intensifying their demands as a new study group on mineral royalties finalizes its report within two months. Last week, at least five chief ministers of iron ore rich states pressed the Centre to raise royalty rates by 20-25% on the basis of spot sale prices. Jharkhand is now demanding a revision of all the 15 minerals and Rajasthan, which imposed a new land tax last year, is demanding that for every $100 per tonne rise in global zinc prices, royalty must rise 0.1%, according to a state official. The rising demand for royalty hike, along with the new taxes and red tape, worry investors. In Madhya Pradesh, for instance, miners have to obtain a permit to move extracted minerals from the mine pit to the stockyard. Foreign investors who’ve waited for more than a decade for mining permits are also concerned about conflicting signals from the Centre and states. “It will be a huge disincentive if royalties are imposed in excess of international norm," said N. Senapati, regional vice-president (India) at Rio Tinto. “Most investors are looking for consistency and certainty of the future, and these sort of moves don’t help the atmosphere." Iron ore royalties are still calculated based on total tonnage, anywhere from Rs4 to Rs27 a tonne, and have not moved to a system based on sale prices. Many feel India is going through the pangs of transition, and the government, which is used to the central style of planning, has been slow to accept change. Others say India needs a single regulatory authority to offer mining permits to speed up production, which would contribute to royalty instead of states imposing an array of taxes. “Government companies were doing most of the mining work but have realized that they can’t do everything," says Andrew Nevin, chief executive of Pebble Creek Mining Ltd, a Canadian firm that been prospecting zinc and gold deposits in India for the past 12 years. “But we are still here and not going anywhere. We think we can make a contribution."